View cart “White Satin Front” has been added to your cart. FREE SHIPPING via First Class Mail to USA destinations. Shipping cost outside the USA: $15.00 to Canada and $20.00 to all other countries. 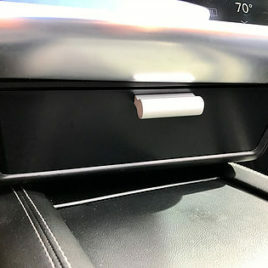 Note: Dash Drawers for RHD Teslas are available now. United Kingdom, and Hong Kong. Interior of drawer is fully lined with velvet. 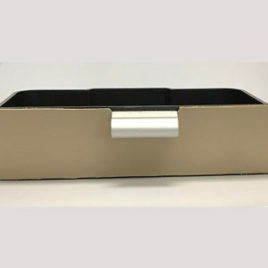 This lining stops objects from sliding around inside the drawer while adding a beautiful elegant look to the drawer interior. Injection molded from a single solid piece, this drawer provides a rock solid, great fit. Rubber bumpers prevent the drawer from opening too far; and the drawer locks in place when closed so it will not fly open even with Ludicrous launch mode engaged. 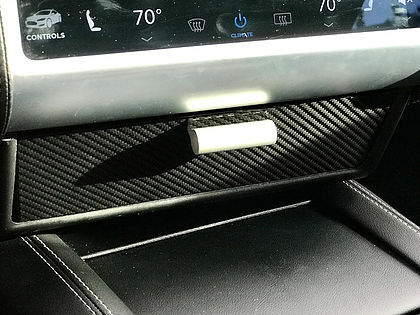 Drawer front is wrapped with 3M 1080 vinyl film which looks like Tesla’s carbon fiber interior. The easy to grip aluminum handle matches the metal trim of your interior. 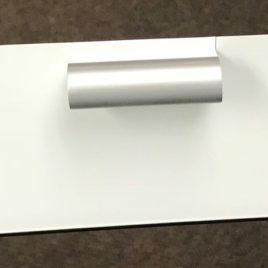 Drawer is simple to remove, should there be a need. FREE SHIPPING via First Class Mail to USA destinations. Shipping cost outside the USA: $15.00 to Canada and $20.00 to all other countries. 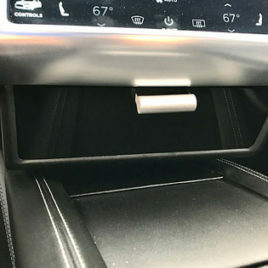 Note: Dash Drawers for RHD Teslas are available now. Indicate in the “Notes” section of the order form that you need the Right Hand Drive Dash Drawer, for countries such as Australia, Japan, United Kingdom, and Hong Kong. This drawer is very sturdy and rock solid, made from injection molding a single solid piece.. The handle matches the display bezel perfectly. FREE SHIPPING via First Class Mail to USA destinations. Shipping cost outside the USA: $15.00 to Canada and $20.00 to all other countries. Note: Dash Drawers for RHD Teslas are available now. Indicate in the “Notes” section of the order form that you need the Right Hand Drive Dash Drawer, for countries such as Australia, Japan, United Kingdom, and Hong Kong.